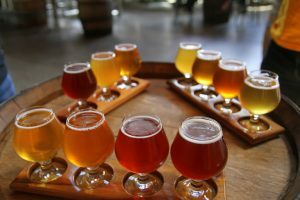 While on your pub crawl of Downtown Las Vegas, you will have the opportunity to try out craft beers from all across the nation. Although you will find some amazing tasting styles of beers, the best way to enjoy a well-crafted brew is straight from the source. Luckily for you, Downtown Las Vegas is where Banger Brewing calls home. With many different brews on tap at their brewery, we feel one stands out and clearly labels the type of experience you will receive at Banger Brewing, making Perfect Ten our featured beer of the week. Las Vegas is known for having the best of the best when it comes to entertainment, food and service. Five guys who know a thing or two about these topics were able to come together and focus their talents on something amazing. With a brew master named Michael “Banger” Beaman, you know that you are going to receive some epic brews. Coming from a background in the food and service industry, Banger Brewing is no stranger to using the finest ingredients. Perfect Ten is comprised of the finest grains, hops and filtered water. The sweetness is brought out in the malt that gives off a honey and caramel taste and is complimented perfectly with the slight bite you will get from the hops. A technique called dry hopping is used to enhance the aromas of the brew without adding too much bitterness. This American Pale Ale goes down smooth with its 25 IBU ranking and 6.2 ABV. Located in the heart of Fremont Street, don’t forget to make Banger Brewing part of your Downtown Las Vegas Pub Crawl. Contact Vegas Pub Crawler to check availability and to book your crawl of DTLV today.